Springhares are large, nocturnally active, diurnally fossorial rodents that typically inhabit arid and semi-arid areas. This lifestyle means that they need to balance excessive heat loss when foraging at night against insufficient heat loss in a potentially warm, humid burrow and both of these against the need to minimize water turnover and energy requirements. In this study we investigated metabolism and thermoregulation in these animals. 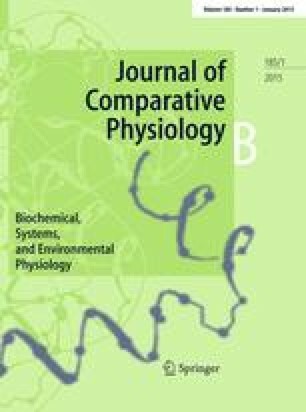 Basal metabolic rate averaged 8.62±1.37 J g−1 h−1 and minimum thermal conductance 0.386±0.062 J g−1 h−1 °C−1. These were higher and lower than expected, respectively. This, along with a relatively low, lower critical temperature and broad thermal neutral zone indicate that springhares are physiologically well suited to the low night-time temperatures, which they typically encounter. Body temperatures were quite labile but springhares became hyperthermic at temperatures above 30 °C suggesting that they are poor thermoregulators at high temperatures. This is attributed to their seldom, if ever, encountering temperatures in this range. Insufficient heat loss under normal resting conditions does not appear to be a problem, as springhares inhabit deep burrows in which the temperature never exceeds the upper critical temperature. Excess heat generated during vigorous underground exercise is presumably stored and dissipated to the cool night air or the cooler soil when subsequently resting. Water turnover and energy expenditure are presumably adequately addressed by other physiological and behavioural characteristics. We thank Alan Page and Jimmy Emslie for allowing us to catch springhares on their farms, as well as all those who assisted in the capture of the animals. The study was conducted under the guidelines and with the approval of the Rhodes University Animal Ethics Committee. Financial support of the South African National Research Foundation and the Rhodes University Joint Research Committee is gratefully acknowledged.